This volume provides a comprehensive understanding of the European Defence Agency (EDA), the leading EU armaments policy institution. Despite its critical role in European strategic and military affairs as the key hub of European policy-making in the field of armaments, the Agency has hitherto received very little attention by the academic and research community around Europe. To fill this gap in the literature, the book covers a multitude of inter-related themes and topics. Not only does it provide a detailed analysis and assessment of the Agency’s record as the first institution dealing solely with EU armaments policy, but it also links these findings to international relations and European integration theory. Thematically, the contributions go beyond the mere description of achievements, gaps and risks, elaborating on novel themes such as space, offsets, pooling and sharing, and transatlantic armaments relations. 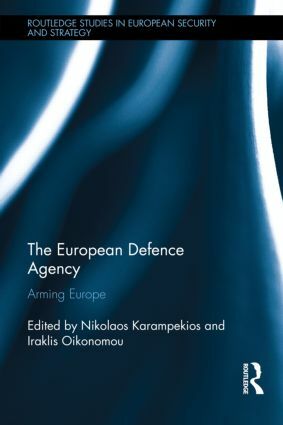 The book combines an interdisciplinary approach to the study of European defence with theoretical and ontological pluralism, and seeks to unveil the strategic, industrial, institutional and ideational sources of armaments collaboration and capability development under the aegis of the EDA. The multi-faceted orientation of the book will be of much interest to students of European security, EU institutions, defence studies, arms control and international relations in general. Nikolaos Karampekios is a research fellow at the Centre for Security Economics and Technology - University of St. Gallen and holds a PhD in Technology Policy from the National Technical University of Athens. Iraklis Oikonomou is a political scientist and holds a PhD in International Politics from the University of Wales Aberystwyth.